In this blogpost I explain how to invoke the process mining tool ProM from the commandline without using its graphical user interface. This allows you to run process mining analyses on several logs in batch mode without user interaction. Before you get too excited: there are quite some limitations to this, which I will address in the end. The following instructions have been tested for the ProM 6.4.1 release. To properly invoke the CLI for ProM 6.4.1, use the following command (which is a copy of the command in ProM641.bat with changed main class). It will read the log file myLog.xes (stored in the current working directory), invoke the alpha miner, and write the resulting Petri net as a PNML file mined_net.pnml to the current working directory. (No, there is currently no way to pass file names as additional commandline parameters to the script). Note: when running the above script ProM will first produce a (large) number of messages on the screen during the startup phase related to scanning for available packages and plugins, bear with it until it is ready. The language used for the scripts is basically Java interpreted at runtime. In principle, you can put any Java code which you would put into a method body (no class/method declarations). In case the Java reflection framework is able to infer the type, variables do not have to be declared, but can just be used like in a dynamically typed language. For example variable log in the script_alpha_miner.txt will be inferred to have type XLog. This will scan all installed packages for plugins that do not require the GUI to run and list them in the form name(input types) -> (output types). For example, if you have installed the AlphaMiner package the following plugins will be listed (among many others). Use the ProM Package Manager to install plugins you do not find in the list of installed plugins. The script_alpha_miner.txt uses the second method signature alpha_miner(XLog) -> (Petrinet, Marking) to discover from an XLog a Petrinet and a Marking. In case a plugin returns multiple objects, the return result is an Object array, in which you can access the individual components as usual, i.e., net_and_marking contains the PetriNet and net_and_marking contains the Marking. Besides the typical plugins you already know from the ProM GUI, there are also plugins for loading files and saving files. Just browse the list of available plugins to find the right type. Now, you basically know everything to invoke ProM from the commandline. Run the ProM PackageManager to install your desired plugins. If you run the PackageManager for the first time, it will suggest a set of standard packages to install which cover most process mining use cases. Get the list of available plugins. Does the plugin require configuration of parameters for which no good default settings are available, so user feedback is requires (for example particular log filtering options)? Did the developer of that plugin have the time to implement a non-GUI version? We encourage users to first develop the non-GUI version of the plugin and introduce GUI-reliant components only later. However as ProM is an open platform with many contributing parties, individual developers may choose otherwise. If a particular plugin is not available on the CLI, please get in touch with the developer whether this can be changed. It may be that ProM CLI does not terminate/close after the script completes. Workaround: include a System.out.println(“done.”); statement at the end of your script to indicate termination. When you see the “done.” line printed on the screen but ProM is still running, you can terminate it manually (CTRL+C) without loosing data. Log files may not be (g)zipped, i.e., the CLI can only load plain XES or MXML files. PNML files produced by a mining algorithm in the CLI have no layout information yet. If you want to visualize such a PNML file, you have to open it in a tool that can automatically compute the layout of the model. Opening the file in the ProM GUI will do. Invoking a the plugin to visualize a Petri net will also invoke computation of the layout. The plugins to load a file or save a file are named rather inconsistently across the different packages. You may have to look for various keywords like “load”, “open”, “import”, “save”, “export” to find the right load/save plugin. Plugins to load a file always come with a signature that take a String parameter as the path to the file to load. Plugins to save a file always require a File parameter. Thus, you first have to create a file handle myFile = new File(pathToSave); and then pass this handle to the “save file plugin”. Files are read/written relative to the current working directory. Even if the plugins you want to use are available for the CLI, executing them may throw exceptions because the plugin (although accessible from the CLI) assumes settings that can only be set correctly in a GUI dialog. The only workaround here is to extend your script with Java code that produces all the settings expected by the plugin. See below for more advanced examples. Creating these scripts is certainly on the less convenient side of development. You have no development environment with syntax check, code completion etc. In case your script has an error, you will only notice at runtime when you get a long evaluation error thrown which tries to highlight the problematic part of the script, but is typically hard to spot. You’ve been warned. Heuristics Miner run from the Command Line, visualizing the output in a new JFrame. If you want to change the parameters of the HeuristicsMiner, you can do this via the HeuristicsMinerSettings object. However, here I have to refer you to the source code of the HeuristicsMiner package to study the details of this class. See https://svn.win.tue.nl/trac/prom/ as a starting point. If you were wondering, yes, that’s how we run automated tests for ProM. Feel free to post further scripts. In case you have problems with running a particular plugin, I suggest to contact the plugin author to make the plugin ready for the CLI environment. This entry was posted in Process Mining, Research, Tutorials and tagged command line, data mining, Process Mining, script, tutorial by dirkfahland. Bookmark the permalink. would this work with rapid miner 6? This could be really useful for research. During my PhD I hacked about with ProM 5.2 to allow me to run many process mining experiments in batch/command line mode and collect statistics on conformance metrics. What I did worked, but was a real mess! This looks much more elegant (as does Prom 6+). Dear Timo, it seems that this is caused by the log package not being installed. This is fantastic, and will be incredibly useful for research! However, what are the preconditions for running it? I’ve been trying to run the command below for Prom66, JRE7/8 under windows for days, to no avail. It throws a few dozen exceptions. I have both the ProM source built under eclipse, and also the regular exe install without the source. Any help is greatly appreciated! My next attempted workaround will be to compile the CLI into its own .jar and just execute it directly. Thanks for posting your question. I’ve just tried ProM 6.6 out of the box with the command you posted and I cannot produce any exception on the scripts that I have. My first guess is that the ProM packages are not installed (correctly). ProM needs plugin packages installed (via the ProM package manager) to be able to do anything meaningful. Perhaps clear your ProM “packages” directory in your %USERPROFILE%\.ProM66 (or ~/.ProM66) directory, run the Package Manager again and install the “RunnerUp” package which will install all the standard packages and plugins for ProM. If this doesn’t help, I suggest you use the ProM user forum https://www.win.tue.nl/promforum/ to post your question together with the steps you took and the exceptions you received. Is the CLI also able to send the data directly to an URL? the CLI in the end invokes Java code, so anything you can do with Java, you can also do via the CLI. The script language used by the CLI is essentially Java code compiled at run-time but outside the context of a class and without imports. So, you can either write your own Java class which is loaded onto the class path or write a ProM plugin that gets invoked from the CLI via its fully qualified name/the ProM plugin name. Within the class/plugin, you can do whatever you want. It’s perhaps not the ideal solution you were looking for from an engineering point of view, but I hope this helps. I’m going deep in ProM 6 so that I can understand how it works and how to create plugins that can enrich the tool. In this context I came across this document. However, I was not able to run this interface because Eclipse did not find it in the ProM project. The only interfaces I could use are ProM with UITopia and ProM Package Manager. Where can I get ProM with GUI, or has this interface been discontinued? I was also able to run ProM through scripts (using ProM with CLI interface). Another point of doubt is in creating a program based on a script. I can’t find in the source codes some of the mining methods that were run in the script. How can I find them? It’s using ProM framework, and designed to work in a non-interactive mode. 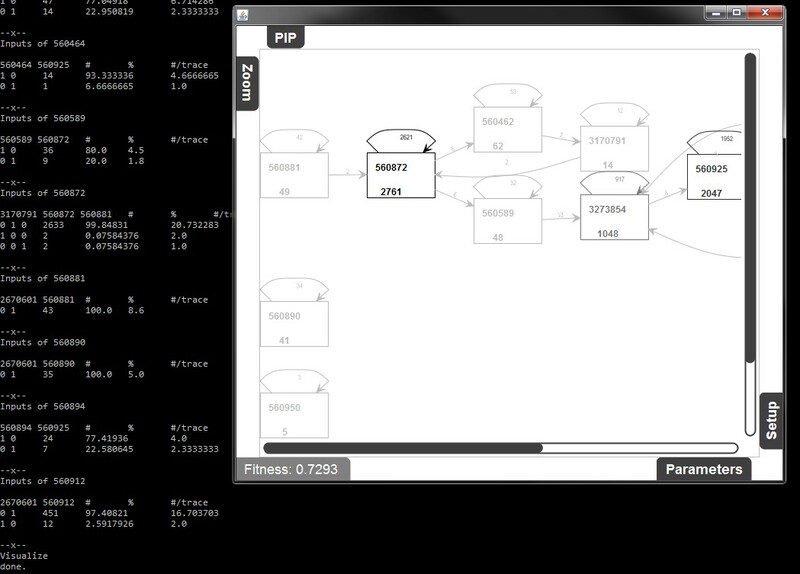 You can easily run process discovery algorithms, produce Petri-nets etc. Hi @dirkfahland, thank you for this tutorial! I am using the command-line approach for my thesis and have made a git repository containing more scripts which may help others. Feel free to add more if you guys want! Thank you Daniel! Much appreciated! Dirk, is it possible to install ProM on a headless server? In particular, is there a way to run all the initial updates of plugins and packages without a GUI? Dirk, Thanks. I may not have a lot of time to look at the code, but if you can point me in the right direction, I’d be happy to take a look. I looked at the code. It seems you are more lucky: there is a command-line main method in class org.processmining.framework.packages.PackageManager that also takes arguments. It should give you help on the available arguments, e.g. “list” lists all available packages. And we have some root packages, e.g. “AllPackages”. Look at svn.win.tue.nl/repos/prom/Packages/ProM-Framework/Trunk/src for the sources. Good luck and let me know if you got it working. If you need to fix something, we can include it.